However, you might want to understand that the encyclopedia section of the CBO volume is to a working real-world deficit reduction program a little bit like the Lego model of Fallingwater is to the architectural plans. This simile is an exaggeration, but it conveys a valid idea. Actual deficit reduction requires a measure of design sense and creativity that a check-the-box exercise cannot embody. A substantial part of this difference is conveyed in sections of the CBO Options volume that are not widely read. Almost everyone picks up the book and riffles through to find the savings numbers for a specific option in some particular budget area. However, the CBO staff work carefully in other parts of the book to explain the nuances and the context of the few numbers that get all of the attention, and those important qualifications are too rarely understood. For example, and most generally: The estimate for the budget savings from enacting each of the hundred or so options is necessarily made independently. However, in any run at the overall budget problem, many of the options will be employed in combination. There are inevitable interactions among many conceivable pairs of options, not to mention large numbers of options enacted together. There is no way to estimate the interactions entailed in every conceivable combination of options in the book. This problem arises in a numerical sense, but also in a conceptual one. Several years ago, a newspaper article described the success of a local citizen group in attacking the deficit with their own plan assembled from the individual components in the CBO book. That year, CBO had presented three different options for reducing Social Security benefits in three different ways based on three different substantive rationales. The citizen group was so impressed with those arguments that they chose all three for their package, and so did a remarkable job at reducing the deficit, and were roundly praised by the newspaper columnist. The only problem was that neither the citizen group nor the columnist had understood that they were proposing to cut the same persons’ Social Security benefits over and over and over again, albeit in slightly different ways and for slightly different reasons. With a better understanding of the context, they would have realized that their plan in effect benefitted from a triple-count of realistic savings in that one very important area. For another: CBO explains that the appropriations process for more than the last two decades has typically operated within predetermined spending caps. The CBO Options book presents ideas to reduce or eliminate specific appropriated programs, with the amounts of savings that would be achieved from each. There is a strong tendency on the part of typical readers to select from among those individual options and mentally bank the savings as amounts of deficit reduction. However, in the context of overall spending caps and in operational terms, those individual options really amount to means of complying with the overall caps, not of achieving additional deficit reduction over and above that resulting from the caps. There has been a lot of double-counting in deficit-reduction plans constructed from the CBO book. 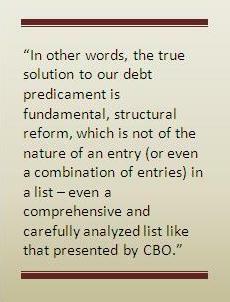 Another knotty issue which the CBO volume cannot resolve definitively is changes in behavior. In the tax area, for example, tightening the treatment of one potential tax-avoidance device might result less in increased taxable income than in additional utilization of another tax-avoidance device. In health care, cutting the reimbursement rate for one particular Medicare service might result in providers choosing different diagnoses for the same ailment, or reporting additional diagnoses that entail additional reimbursements. This measurement and policy issue is serious but should not be exaggerated. Like cold air infiltrating a leaky house, such spending follows the path of least resistance. Plugging one of several holes may not solve the entire problem, but it does force the leakage into a channel of greater resistance. Still, it is useful to understand that each individual CBO savings estimate must rest on uncertain assumptions about human behavior, and that any given combination of policy choices may influence the ultimate outcome because of their collective impact on that behavior. Finally and in the same spirit, consider that in the long haul, the federal debt problem boils down to health care. The future is inherently unknowable with precision, but one part of the future where CBO always refuses even to hazard a guess is the benefit of competition. Competition is Adam Smith’s “invisible hand,” and CBO cannot measure the invisible hand – precisely because it is invisible. The health care solution, CED believes, must come from competition. However, because CBO will not “score” the savings from competition in health care, CED’s proposal for reform of the entire healthcare system never even will make it into the Options book. The CBO options are restricted to ideas that boil down to reductions in reimbursement rates, which CBO can “score” – but which are most unlike to “bend the cost curve,” which is essential actually to solve the long-term cost problem. In other words, the true solution to our debt predicament is fundamental, structural reform, which is not of the nature of an entry (or even a combination of entries) in a list – even a comprehensive and carefully analyzed list like that presented by CBO. CBO knows that, and understands the limitations of the Options volume. That volume is a necessary, but not a sufficient, part of our inevitable approach to a debt solution. You should be aware of CBO’s work, and if you have the chance to spend time with it you will be as impressed with the quality of the work as you will be depressed by the implications. But consider the context and the nuance while you check the boxes and tote up your personal selections.